The final weeks before an event are the toughest to get right. The common notion that all hard work must cease and inactivity must ensue is incorrect. It’s also foolhardy to continue amassing mileage and tough workouts as race day nears in hopes of improving fitness. Depending on your approach to this all-important time period, you may be left feeling lethargic or simply exhausted. A runner with the proper peak will feel rejuvenated and ready to go on race day. Greg McMillan, my mentor, has devised a set of rules to live by as race day approaches. Greg explains, “By studying peak performance research – both physiological as well as psychological – as opposed to just the tapering research, I’ve been able to dial in how to truly peak on race day. It works for all athletes no matter where you find yourself in the pack come race day.” By placing Greg’s simple and effective system into context, let’s get you prepared for your next ultra. Though there are some that prefer three weeks to peak, two weeks seems to be the most popular choice. During the first week of a peak, drop the length of each run by 10 to 20 minutes. The week before your event, drop volume by 20 to 30 minutes per run. I recommend that ultrarunners limit their last long run(s), done a week before the key event, to 90 easy minutes (regardless of the distance of the event). This is enough to give you that long run feeling, but short enough that muscle recovery and glycogen-storage continue. Light, non-impact cross training can be done in lieu of runs, but only if you are used to those forms of exercise. Run, eat, sleep, work, and socialize when you do normally. Your body and mind have achieved stasis over the past few months of training. Keep them both happy and the keel even. Now is not the time to experiment with new workouts, forms of exercise, foods, and social events. Use the extra time not spent running for sleeping and sticking to “safe” hobbies. Before the 2007 JFK 50 Mile, I had an exchange with fellow competitor Andy Mason. Nine days before the race, he completed a round of very quick mile repeats on the track; his last quality workout before the race. I knew he was fit and feeling confident. That year, Andy finished in the top ten. Though most ultrarunners do not need to perform a tough round of mile repeats before their next race, they might consider doing some sort of confidence-building workout 10 days to two weeks out from their event. This workout, however, should be in tune with recent training. Running a 30-mile training run or time trialing up and down Hope Pass (like the author) a few days before a race is neither smart nor beneficial. A moderate length workout that you’re familiar with, that is aerobically challenging, allows for adequate recovery before race day, and demonstrates your fitness should be the order of the day. If you don’t routinely perform hard hill, stamina-building, fartlek, or fast finish workouts then this is not the time to start. Maintain your current training and follow the guidelines for reduction in mileage as mentioned above. Now is also the time to reflect on all of the training you’ve done thus far. Remember that you’ve done the work necessary to get you to the finish line. This is like returning from injury. Gradually and slowly increase the length of your post-race easy runs and avoid fast and difficult workouts. You won’t reach your normal training level, but you’ll satisfy the need for a few runs before your next event. When I asked Joe Kulak what he did between each of his four 2003 Grand Slam record- setting 100-mile races, he quipped, “I sat on the couch and drank beer.” If beer is not your drink of choice, water works just as well. The reality is that you can’t gain fitness in the two or three weeks between long ultras. Recovery will be your best “workout” while preparing for your next event. McMillan, Greg. “Performance Page: Don’t Taper. Peak!” Running Times Magazine. Running Times Magazine, 23 Aug. 2012. Uncanny timing. I just started tapering for a race in two weeks. Thanks for the helpful article. On another performance-related note, there is a recent study by the Kellogg School of Management indicating motivation in an endeavor can reach its low at the halfway point to completion: "It is the 'attentional shift' from the initial to the final state of the endeavor that causes the level of motivation to reach its nadir roughly halfway toward the goal, when both the initial state and the end state seem distant." The 'halfway' point in a 100 mile race is about mile 60. A look at the HR100 DNF's this year and 2010 show that Grouse Gulch at mile 58.4 had the most drops. It would be interesting to draw data on where most DNF's occur in all 100's. Success at an ultra is as much mental as anything and being aware of how your motivation may slip can not only prevent dropping, but also help overall performance. Great piece, Ian. The only thing I would suggest is that runners use a percentage drop in running volume instead of fixed times, since we all probably run for different lengths of time each week. In the second to last week I typically cut running time (and milage) by 50% and in the final week I run about 25% of normal. Of course, this is a variable based on the distance of the race. In this example I'm talking about ultra distance races. A last week before a 100 a typical week would look something like: M-60 mins steady, T-off, W-45 mins with 5x1min strides randomly inserted, T-off, Fri-25-30min shakeout jog just to get the legs firing and take the edge off the anxiety. Of course, this works for me after trying just about every variation of tapers. Great article, as usual Ian ! Just to be certain, you mean the longest run during the taper should not extend 90 minutes, even if you´re used to much longer runs ? In general, yes. As ultrarunners we tend to overdo the volume of our runs going into our key events. If you're training through or using a race as a training run things might be different. But for key events, two weeks of reducing the volume of your long runs won't negatively affect your fitness, but will allow for proper glycogen storage, muscle restoration, and mental sharpening for the big event. Give it a try next time! Just recently sc###ed UTMB badly, got another 100 miler (which hopefully won´t get shortened by bad weather, too) coming up in 6 weeks so I will certainly give it a try ! Good luck lad! Have fun! Super points. I like the idea of not focusing on the decrease of weekly mileage or time, but instead decreasing each run by a percentage. Great point and another great way to go about the reduction in volume. Thanks for the input! I'm not quite sure what you're asking, but, in general, I also place the longest training run 5 to 8 weeks out from the key event. However, this doesn't necessarily mean that this was the biggest week in volume. If you choose a three week peaking period you'd need to decrease the volume incrementally as well, either by time, mileage, or percentage. Your decrease per week just wouldn't be a steep in a three week peak as if it were a two week peaking period. Did that answer your questions? Ian, enjoyed your article but have to disagree with the 90 min. final long run rule. as a 60 yr old runner w/ 55 marathon + events bagged, i have actually had good success with 20+ mile runs a week before the event. ie: 20 miles 1 week before 2003 Austin marathon (2:57) 50 yrs old. my point is that as Bill Rodgers once said, "we are all an experiment of one." rules as suggestions are fine but keep in mind that there are no magic bullets for "success" and we each roll differantly. keep up the good work and excuse my "old fart" ramblings. So true. I agree with you; to peg us all into the same hole is absolutely archaic and insane. But I'd have to argue that that one last 20+ mile training run 7 days before race day probably didn't sport you that 2:57…it was most likely all the hard training you did prior to that. Yeah, I noticed after I posted that the longest run is not in the same week as the max mileage week, which comes a couple weeks later than the longest run. Unfortunately, my tracking of my training is so poor I have little idea when my peak mileage week is. I just know that I run a lot, get in my last long run at some point, taper, and hope for the best! I'm sure I would do better if I took a more systematic approach, but it sorta works this way and I'm having fun, so it must be OK. Thanks for the reply! Andy Mason!! Woot Woot. The man that covered all my High School XC and track races.. small word! Rather than speaking in terms of minutes (10-20 two weeks out, 20-30 one week out), what do those correspond to in terms of percentages? I'm very interested to hear the answer since tomorrow Sept 21) is the first day of my 2-week taper. 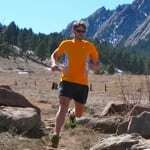 "The only thing I would suggest is that runners use a percentage drop in running volume instead of fixed times, since we all probably run for different lengths of time each week. In the second to last week I typically cut running time (and milage) by 50% and in the final week I run about 25% of normal. Of course, this is a variable based on the distance of the race. In this example I’m talking about ultra distance races. A last week before a 100 a typical week would look something like: M-60 mins steady, T-off, W-45 mins with 5x1min strides randomly inserted, T-off, Fri-25-30min shakeout jog just to get the legs firing and take the edge off the anxiety." I just read this article and I am wondering about strength training. Should that be eliminated during the 2 week peak or can it comtinue if it is a part of one'a daily routine? Good question. I suggest you start by falling back to body-weight only exercises in the peaking phase. Stuff you can do at home with no added weight, no need to continue using free weights or gym machines at this stage of the game. Definitely not the time to start any new kind of routine either. Then I'd eliminate it all together a week before your event. This is my advice for a GOAL event. If you're training through an event, then I'd keep the routine you have established and just eliminate the weight work 3-4 days before the event.